PPIK, Pusat Pengajian Ilmu Kemanusiaan , HCC, Han Chiang College , SUNU, Sunway University . (2560). National Conference on Creativity in Education & Humanities 2017: Empowering People (NCC2017). PPIK, Pusat Pengajian Ilmu Kemanusiaan , HCC, Han Chiang College , SUNU, Sunway University . 2560. "National Conference on Creativity in Education & Humanities 2017: Empowering People (NCC2017)". PPIK, Pusat Pengajian Ilmu Kemanusiaan , HCC, Han Chiang College , SUNU, Sunway University . "National Conference on Creativity in Education & Humanities 2017: Empowering People (NCC2017)." PPIK, Pusat Pengajian Ilmu Kemanusiaan , HCC, Han Chiang College , SUNU, Sunway University . 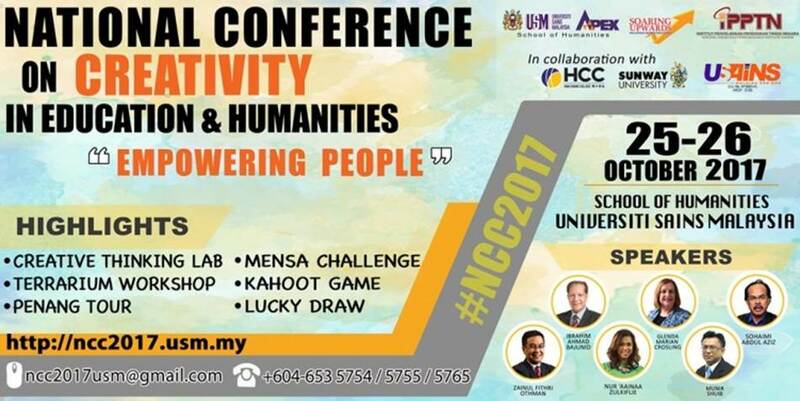 National Conference on Creativity in Education & Humanities 2017: Empowering People (NCC2017). กรุงเทพมหานคร : Universiti Sains Malaysia, Malaysia; 2560. The Effect Of The Basic Education Teacher Diploma Training Programme (BETD) On Teachers' Productivity In Caprivi Region, Namibia [LB1727.N3 S193 2008 f rb]. Pendidikan Guru Di Malaysia : Perkembangan Dan Perubahan Kurikulum Ilmu Pendidikan Di Maktab Perguruan, Tahun 1987 Hingga 1986 [LB1727.M2 H338 2008 f rb]. PLG 518 - PENGAJIAN PENDIDIKAN GURU MAC 05. PLG 531 - PENGUKURAN PENDIDIKAN OCT 04.